Ben Matthews is a fulltime variety entertainer, who has been performing professionally since 1993. As well as stand-up comedy, his skills also include juggling, unicycling, magic and mime. Performing over 350 shows a year, his one man act has been seen in Hong Kong, Singapore, Malaysia, Brunei, Thailand, India and the UK. He has appeared on tv, radio and in the theatre. Born in England, he is currently based in Hong Kong. 1996 one-man juggling and unicycling shows in all Singapore’s major hotels, shopping centers, museums and tourist attractions. (OVER 350 SHOWS A YEAR). 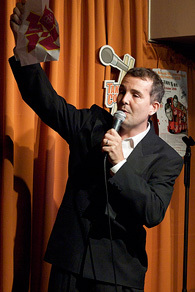 2002 to the present day His “Big Ben Comedy Show” has been entertaining at corporate dinners for multinational companies such as Fuji, Microsoft, IBM, Motorola, Cycle and Carriage, Phillips, Hitachi, Shell, HSBC, Mitsubishi, Minolta, Proctor and Gamble, Pfizer pharmaceuticals, British American Tobacco, the US Air Force, Singapore International Airlines, Singapore’s Army, Navy, Police force and Airforce, Citibank, Hyatt hotels and many more! The Miller’s tale (Oxford 1990), If only I had a heart made out of Levis, (Singapore Arts Fest 1999), Something Totally Uneducational (1999), commander of the USS Enterprise in the Star Trek World Tour (Dec 1999-Feb 2000), Luna-id’s: Alice in Wonderless Land (Singapore Arts Fest 2000), Imaginart’s Sparkleshark (Singapore’s Drama center 2001), Luna-id’s: Joined at the Head (Raffles Hotel Jubilee Hall 2001), Singapore Repertory Theatre’s Little Victories (2004), Wild Rice’s the Visit of the Tai Tai (Victoria theatre 2004), the leading role in Begum a musical (Hyderabad India 2005) and many more! Cinemime (Singapore’s Drama Centre1997), Was It Something I Said? (1998), MimeMobile (Singapore Art Museum 1999), Mime Unlimited’s Cinderella dreams (2002), and many more! Over 75 primary and secondary schools, as well as junior colleges, polytechnics and universities.